As I write this from the Living Room of our Ballygunge residence in Kolkata, I realize the current trip to India indeed has been different. Other years we have visited India mainly on a show tour, taking our laser-live extravaganza to different cities. In fact, the last three years (2012 to 2014) we have been busy taking the much-acclaimed “Swamiji”, an hour-long laser documentary on Swami Vivekananda across India in different cities covering Kolkata, New Delhi, Vadodara, Ahmedabad, Rajkot, Mumbai, Pune, Mysore, Bangalore, Deoghar, Shibpur, Salt Lake, Narendrapur, Belur, etc. - all organized by Ramakrishna Mission in collaboration with the Cultural Ministry of the Govt. of India. During those trips, there was a whirlwind of energy carrying forth from show to show, and not a lot of time to stop and enjoy visiting my home city, taking in its beauty. This time, the trip during Durga Puja has come unplanned, more as a bonus, as we were already more than halfway across the globe, attending the 27th Annual Conference of the International Laser Display Association in Dubai, where our entry “Light Art in Shower Ocean” won the First Place in Innovative Application and got "ILDA Artistic Award". Going through the old drawers in our bedroom Almirahs at Ballygunj residence, I came across my old Autograph Book with orange hardcover that I had purchased at the age of 11 in Calcutta and treasured all these years. When I opened it, memories first flashed through my mind and soon flooded bringing tears into my eyes. It had precious autographs from many icons from the era 1956 to 1967, and then suddenly stopped, with many empty pages left. I remember purchasing it from a local store in early 1956, and then started collecting autographs till 1967, a year before graduating with a BSEE degree from BHU (now IIT-BHU), in Varanasi. After graduation my priorities drifted away from the collection of autographs, and hence the sudden stop. A great majority of the autographs were from film stars, filmmakers, singers, journalists etc. and international magicians who either visited our home or came to see my father’s magic shows at the New Empire Theatre, Calcutta. 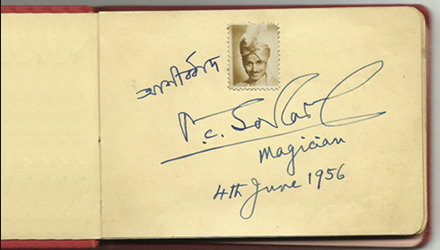 These included autographs from film actors Pahari Sanyal, Uttam Kumar, Bikas Roy, Namita Sinha, Anuva Gupta, Biswajit, Tripti Mitra, singers Satinath Mukhopadhya, Shyamal Mitra, journalist Vivekananda Mukhopadhya, film director Debaki Bose etc., and many more from magicians from the USA, UK and Japan. But the autographs that stood out most and touched my heart were from three great men, my father P.C. Sorcar, magician; poet Sunirmal Basu, and painter Jamini Roy. I recall the day when I asked my father for the first autograph of the book. This was on June 4, 1956, and I was still a preteen. He smiled as he wrote “Ashirvad” (“Blessings”) in Bengali and asked, “Have you finished your homework?” I said, “Sign your name in English, father, because they know you as P.C. Sorcar”. He smiled again, gave his autograph in English like he normally did, and asked again “Have you finished your homework from school?” “Yes, I have”, I said. “OK, now you can go and play”, he said. I recall, how, all of us five siblings eagerly waited listening to his stories about the latest show-tour across the globe and he would open up having fun with us. But when it came to studies he was always the strict father who disciplined us reminding education must always be number one! I had a unique, miniature brown and white photo of my father in his magic costume that he had gifted me in a different occasion. It was one of my favorites because of its size, which looked like a postal stamp. 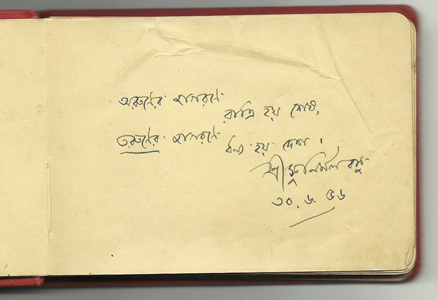 I pasted it above the autograph of my father and took pride in the fact I had done something special to decorate the very first page of the book, which carried my father's autograph. (The rise of the Sun ends the night. Poet and writer of children's books, Shree Sunirmal Basu was born in Giridih, Bihar, on July 20, 1902. His father worked in Patna. After matriculating from Patna, he was admitted to Saint Paul's College, Calcutta. But he did not complete his studies and joined the non-cooperation movement of Mahatma Gandhi in 1921. I loved the little verse then perhaps because of its rhythms, but gradually it’s meaning captured my heart. The simple four lines with underlined "Taruner" (Youth) gave a vivid reflection of his mind, which showed how much he loved the nation and in joining the movement of Mahatma Gandhi that brought freedom, his unconditional love and faith in the youth, and inspiring words of a wake up call. What an evergreen, timeless and powerful message it carries for all of us! Sree Basu passed away in 1957. 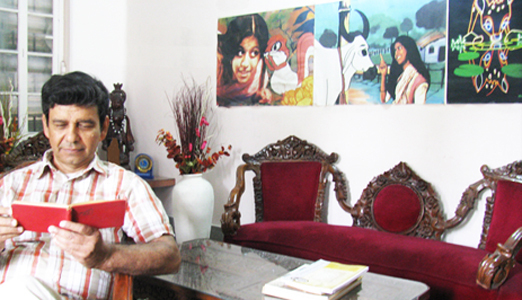 I remember the day when I accompanied my father to the home of the great painter Shree Jamini Roy. He lived in Ballygunge Place, not too far from our home in Ballygunge. It was a bright morning on June 18, 1967. He was 80 years old and still painting. My father was 26 years younger than him, but both artists had deep respect for each other’s work for years and were good friends. He invited my father as he was concerned about the preservation of his artwork and wanted to discuss preservation techniques. He showed some of his unique paintings that he had recently done on bamboo-mats (“Pati”), most painted in his characteristics “Potua” style, with unique signature of his own. I was simply fascinated with his creativity; what a magnificent piece of pure Indian art on a simple, ordinary, daily material used as the canvas! How much of a pride, love and joy were wrapped in that creation! 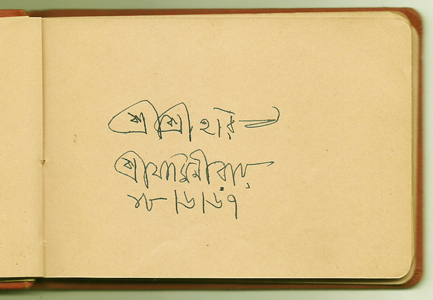 When I touched his feet for blessings and asked for his autograph, he wrote in Bengali "Shree Shree Hari" (“Lord the Beautiful”) followed by his signature "Shree Jamini Roy" with the date June 18, 1967. Soon my father and him were absorbed discussing about the preservation techniques. When I look back in the life story and background of Shree Jamini Roy and my father, I find strange similarities. Shree Jamini Roy graduated from the Government College of Art, Calcutta. He was taught to paint in the prevailing academic tradition drawing Classical nudes and painting in oils and in 1908 he received his Diploma in Fine Art. But soon he felt the huge emptiness and realized he needed to draw inspiration from his own culture and not from Western traditions. He dropped his Western views on art and dived into the living folk and tribal art and embraced "Kalighat Pat" or "Patua art" for the rest of his life! Though magic was traced in Sorcar ancestry for several generations, my father was the first to take it up professionally. His early life as a professional magician in the early 1940's had Western influence. It was the era of British-India; he and all his assistants, male and female, wore Western costumes, performing Western style magic items. But soon he felt the vacuum and realized his inspiration and strength lied in his own culture. He took pride with Indian magic that rooted back to the mythological "Indrajal" of Lord Indra - the king of Gods, Bhoj-Baji or Bhoj-Vidya that existed in the era of Bhoj Rajah, and Bhanumati. He also saw how the art of Indian magic that once flourished during King Vikramaditya and even in the courts of Mughal emperors with "Bongal-ka-Jadu" had slowly deteriorated with continuous foreign invasion and slowly went down to the hands of illiterates and street Jaduwallas. He was also disturbed to see how many of the Indian magic items were looted and ended up on the stages of Europe and the West. He researched, authored many books, and picked up the neglected Indian art from its abused condition, gave shape, size and color and brought it to limelight giving a dignified international standard. By then he had already abandoned Western thoughts, proudly wearing costumes of a royal prince with plumed turban, with elaborate stage settings, crew, magic items, decors, music, and even the design of the show posters and tickets - all weaved with deeply rooted Indian culture!! Today, as I see all the autographs and particularly of these three great men on my book, I feel fortunate to have met them in my lifetime and I salute them from my heart.